102 Not Out, starring Amitabh Bachchan and Rishi Kapoor, opened at Rs 3.53 crore on Friday. Trade analyst Taran Adarsh tweeted that though the film started on a slow note it gained momentum in the evening. 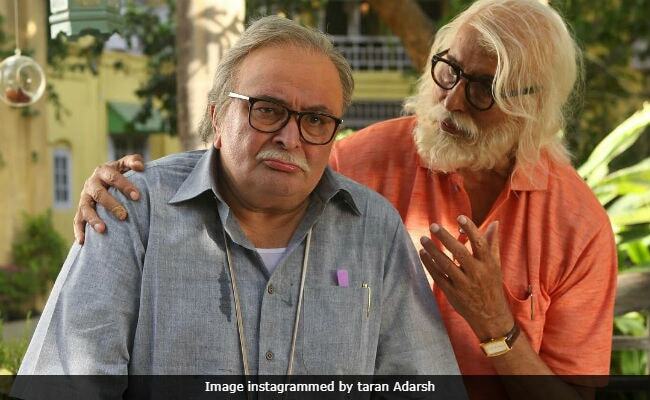 "Like most content-driven films aimed at families, 102 Not Out started on a slow note, but gathered momentum from evening onwards... A healthy growth is on the cards on Saturday and Sunday... Word of mouth is super-strong," he tweeted. The Umesh Shukla-directed film opened along with Hansal Mehta's Omerta, starring Rajkummar Rao. 102 Not Out gave a stiff competition to Omerta, which collected only Rs 54 lakh. However, both films were snubbed by Hollywood film Avengers: Infinity War, which has entered its second week and collected over Rs 7 crore on Friday. Like most content-driven films aimed at families, #102NotOut started on a slow note, but gathered momentum from evening onwards... A HEALTHY GROWTH is on the cards on Sat and Sun... Word of mouth is SUPER-STRONG... Fri 3.52 cr. India biz. 102 Not Out opened to poor reviews, which did not translate into bad performance at the ticket window. Like Taran Adarsh said, the word of mouth for the film is "super-strong." Movie-goers apparently differ from film critics who've reviewed the film and said it's "dull." Raja Sen wrote: "The primary issue is that 102 Not Out is too static. This lack of dynamism is both physical and emotional." 102 Not Out is the story of a lively 102-year-old man living with his somber 65-year-old son. The father, played by Amitabh Bachchan wants to break the record of the oldest living person. He plays football and has fun while his uptight son insists he should "act his age." 102 Not Out is based on a Gujarati play by the name, written by Saumya Joshi.